We work with people who have at least one of these characteristics: They don’t have the time, desire, or knowledge to develop and monitor a successful wealth management plan and desire some professional expertise to help them. Do you specialize in one certain area of financial planning? As Certified Financial Planners(CFP®), we have extensive training and experience in the areas of retirement, investment and estate planning, along with tax saving strategies for wealth accumulation and preservation. Our primary focus is working with individuals and families who are near or in retirement and are seeking to maximize their financial resources, and preserve their nest egg for long-term retirement security. Our expertise is the result of years of education and hands on experience. Each Principal graduated from college with a financial degree and has passed the rigorous Certified Financial Planner or CFP® exam. In addition, to maintain these credentials, we are required to complete annual continuing education classes relating to financial issues and topics in order to keep growing in our abilities to help clients accomplish their financial goals. Bruce has been in practice since 1988 and Nate has been providing financial advice since 2006. Ultimately, it is the many years of combined experience we have gathered in working with individuals that has given us the best tools and knowledge to develop strategies and help clients best secure their financial future. In addition to the ongoing training and education mentioned above, we are members of the Financial Planners Association (FPA). This professional association is a great resource for obtaining information on new ideas and planning techniques, as well as changes in tax and legislative law that affects our industry. What type of investment products do you manage for your clients? Our asset management system is designed to match the appropriate mix of investments to fit each individual client’s risk and return parameters. Portfolios may include but are not limited to index funds, exchange traded funds, stocks, bonds, money markets, mutual funds, certificates of deposits, annuities, and various alternative investments. These are examples of commonly used tools that provide a balance of safety, income, and growth to fit each client’s objective. Does LifeStage Wealth have their own proprietary products that are used? No. As independent wealth advisors, we have no proprietary products to sell to clients. We have no connection or hidden agenda to use any one investment firm’s products. Our focus is to use the products that are most suitable for our client and are most appropriate for them. Does LifeStage Wealth have an Account Minimum? Yes, in order to maintain a high level of service for our existing clients, our minimum for invested assets under management is $250,000. How does LifeStage Wealth get paid? 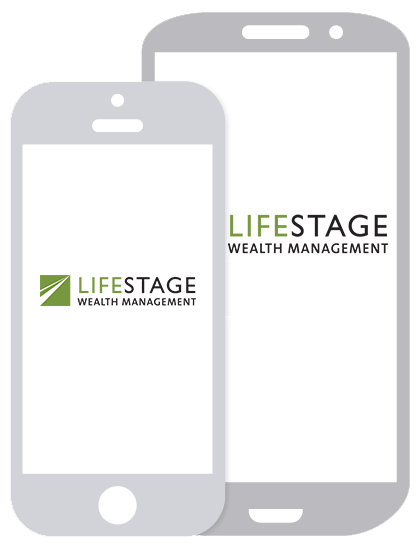 LifeStage Wealth is a fee-only registered investment advisor (RIA). Our compensation is based on a flat percentage fee of assets under management. This arrangement eliminates any conflict of interest and allows us to be focused on the same goals as our clients: maintaining financial independence through wealth accumulation and preservation.